Dental Bangkok, Dentist Bangkok - Zoom Teeth Whitening. Here at BANGKOK SMILE DENTAL CLINIC @ Sukhumvit 5 we can offer our clients an effective and efficient alternative to laser whitening with the Philips Zoom whiteSpeed system. 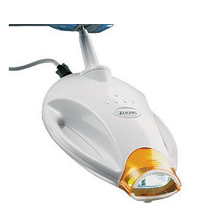 This treatment uses LED light technology, as opposed to a laser. At BANGKOK SMILE DENTAL CLINIC @ Sukhumvit 5 we only use products and systems that are safe and are the leaders in their field. The Philips WhiteSpeed system is by far the best LED teeth whitening treatment available and our highly trained teeth whitening team are experts in its use. In studies the WhiteSpeed LED system was shown to give up to 50% better results than other similar systems. With results such as this at Smile Republic we are pleased to be able to offer our clients this technologically advanced, market leading treatment which is conducted by our professionals who are expertly trained in this field. You will have a consultation with one of our BANGKOK SMILE DENTAL CLINIC @ Sukhumvit 5 tooth whitening experts who will explain to you the options available to you so that you are fully aware of the advantages and disadvantages of the treatments available and the cost involved. This allows you to make a properly informed choice as to whether the Zoom WhiteSpeed treatment is the best treatment for you. 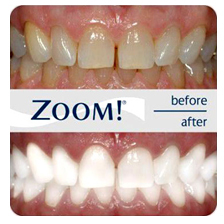 On choosing the Zoom WhiteSpeed treatment our whitening expert will explain the process to you in full and answer any questions you may have. How does the Zoom WhiteSpeed system work? The WhiteSpeed system works in a very similar way to laser whitening. We apply a gum barrier which isolates the whitening gel to your teeth. The whitening gel is then applied to your teeth and the active ingredients are activated using the Philips LED light. 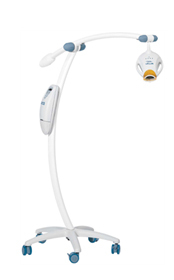 The Philips high intensity light speeds up the whitening process and helps lift stains off the enamel of your teeth. Once the LED light has been activated you can relax and the treatment can be completed by our experts in as little as 45-60 minutes. The results that are achieved from this process vary from person to person. The level and nature of teeth staining is different in all our clients, however recent studies have shown that the average result from the process shows an improvement of an average of 7 shades lighter following the treatment with some results as high as 15 shades lighter. The results are perfectly natural looking and are instant. The effectiveness and unobtrusiveness of this process makes it one of the most popular treatments for our clients at Smile Republic. Does the treatment cause any tooth sensitivity? Teeth Sensitivity during and after teeth whitening is an important concern for our clients and for everyone in our office at Smile Republic. We want you to be comfortable during and after the procedure. Some feelings of sensitivity during the process is common and quite normal. While most of our clients complete the entire treatment, it’s important to understand Zoom teeth whitening is probably not for everyone. Studies have shown that 9% of people undergoing this treatment experienced slight sensitivity and only 2% experiencing severe discomfort. At BANGKOK SMILE DENTAL CLINIC @ Sukhumvit 5 we are well aware that everyone has a different life style, different activities, different food and drink. All these factors can have an effect on your teeth, so the longevity of your whitening results can depend on your life style and your own disciplines in dental hygiene and maintenance. Frequent use of a good quality toothpaste and regular checkups will help you maintain your beautifully whitened teeth for several years. Because we want you to enjoy and be proud of your whitened smile our experts at Smile Republic are happy to advise you on how to help preserve your beautiful smile. For the first 48 hours the pores in enamel are open, they can absorb stains faster than before. We provide our clients with advice and guidance on what they can and cannot eat or drink during that time. As a rule anything that stains a white shirt, will stain your teeth. We realize that the diet is very restrictive. Please do your best, if you happen to eat or drink something you shouldn’t then brush your teeth or rinse with water right after. If you plan on drinking coffee or similar liquids, please do so with a straw, this way only the back of your teeth are exposed to coffee. Whichever teeth whitening treatment you opt for you can be assured that at Smile Republic you will receive the very best attention from our team of highly trained experts using the very best products and systems available all of which are proven as being superlative in their particular field. At Smile Republic your care and satisfaction is our primary objective.